some representing the Scottish Team at such events & one even on the UK National Team!. Made to carry 30 rounds of ammunition for Police Pistol type competitions...more commonly shot in the UK now with either Marlin or Winchester lever action rifles, or long-barrel revolvers. Designed to hold the cartridges in 2 rows of 15 per row, these can also be supplied with different loop spacing arrangements...such as in 3's, pairs, etc. 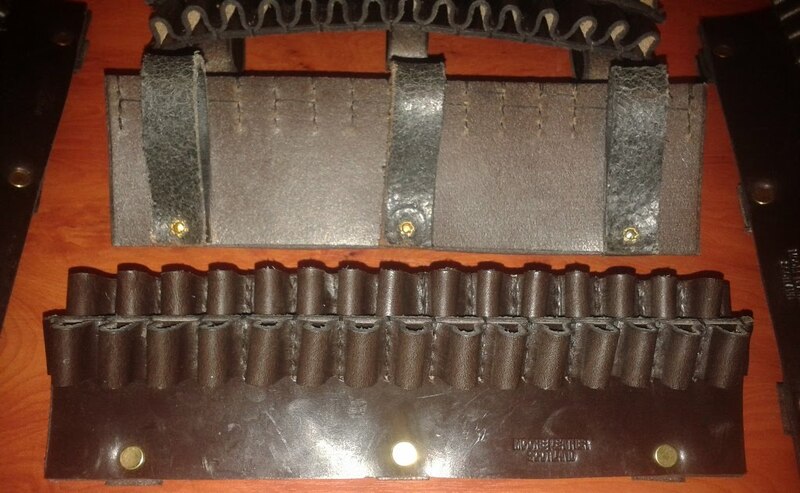 The basic design, as offered here, has fixed belt loops and is available in tan/brown, black or in an un-dyed leather. Offered in 2 main sizes: .38/.357 OR .44/.45/.410 shotgun - other calibres ARE available to order. The basic design has fixed belt loops and is available in tan/brown, black or in an undyed leather.